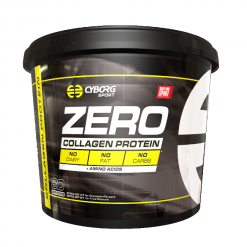 Cyborg zero is a delicious new protein manufactured from hydrolysed collagen peptides and essential amino acids. This exceptional combination offers an impeccable balance of high quality protein which is extremely absorbable with causing any gastrointestinal discomfort. 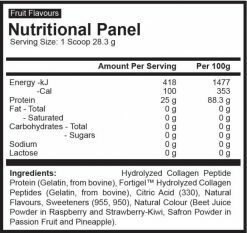 This protein is completely free of colours, artificial flavours and gums and is highly suitable for those with dairy sensitivities or intolerances. 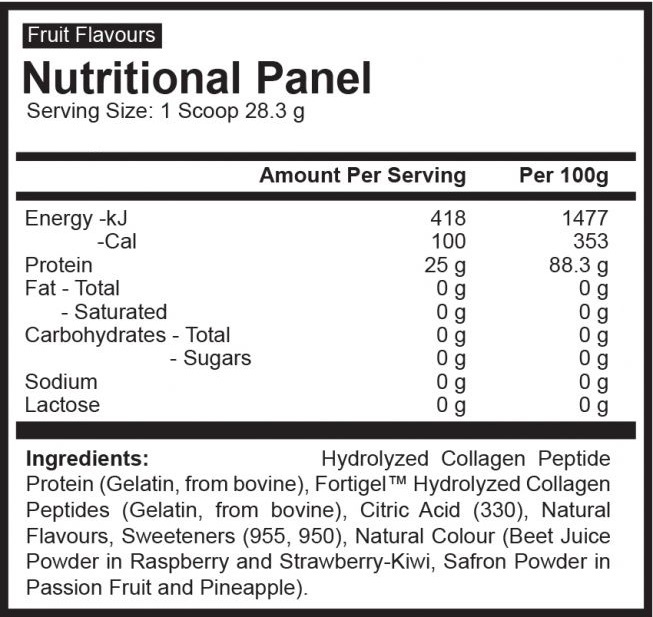 Alanine: Is a non-essential amino acid that can be manufactured from other sources if required. Alanine is one of the simplest of the amino acids and is involved in the energy producing breakdown of glucose. In condition of sudden energy need, when muscle proteins are broken down for energy, alanine acts as a carrier molecule to take the nitrogen contain amino group to the liver to be changed to less toxic urea. Arginine: An essential amino acid which increases insulin secretion and is converted to urea in the liver by arginase. Tyrosine: Is used by the body to stimulate chemical messengers that are involved in releasing norepinephrine and dopamine. Aspartic Acid: Is an amino acid that acts on the central region of the brain causing a release of hormones including the luteinizing hormone, growth hormone and follicle stimulating hormone. Cysteine: Is known as a non-essential amino acid which is a key component of glutathione which supports various vital physiological functions. It functions in detoxification, skin formation and the recovery of hair and nail tissue. It also enhances the immune system function by encouraging the white blood cell activity. Proline: Is a non-essential amino acid that is an essential component of collagen which is vital for adequate functioning of joints tendons. This amino acid helps maintain and strengthen heart muscles. Glutamic acid: Is a non-essential amino acid that stimulates neurotransmitters in the spinal cord and brain and is also required for adequate cell functions. Glycine: Is a non-essential amino acid that regulates the synthesis of bile which functions in the digestion of lipids. This amino acid is also important for the development of skeletal muscles, tissues, synthesis of nucleic acids and structural integrity. Histidine: Is a semi-essential amino acid that functions as a precursor of histamine which is a compound that is released by the immune system in an allergic reaction. Threonine: An essential amino acid that makes up collagen, elastin, bones, enamel protein and promotes the metabolism of lipids in the liver. This amino acid also supports cardiovascular, liver, immune and central nervous system functioning. Lysine: Is an essential amino acid which has an important role in calcium absorption and building muscle proteins. Lysine aids in the recovery from trauma or surgery and helps the body to produce hormones, enzymes and antibodies. It also has an important role in the production of carnitine which is a nutrient that converts fatty acids into energy. Tryptophan: Is an amino acid that is an essential building block for numerous organic molecules including enzymes, serotonin, neurotransmitters, melatonin and structural proteins. Serine: Is a non-essential amino acid that has an important role in various biological pathways in the digestive and central nervous system. It also aids in the functioning of RNA and DNA and manufactures serotonin.